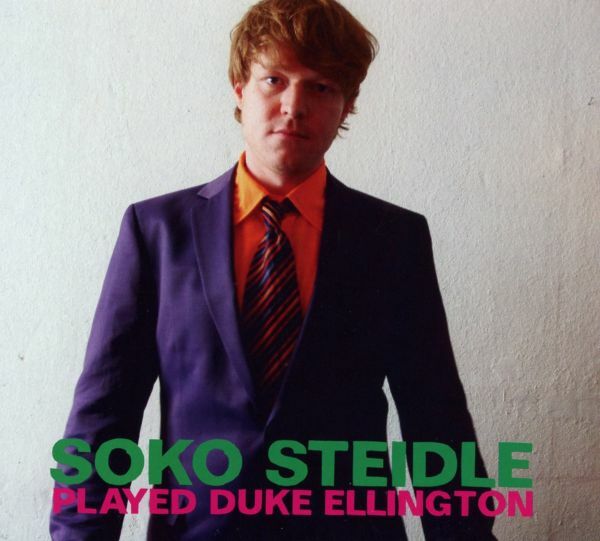 Notice the past tense in 'SOKO Steidle Played Duke Ellington', since, needless to say, Oliver Steidle, Rudi Mahall, Jan Roder and Henrik Walsdorff have played Ellington sometime, - not on this CD, however. "We wanted to name the CD as if we had played Ellington", says drummer Steidle for the Berlin four who arealways joking around. "It is definitely a dig at fellow musicians, who merely play along standards. We playthrough all song titles, from 'In A Sentimental Mut' (i.e. courage) or 'Flusch Life' to 'Felse mich im Rhythmus' (a crude translation of 'Rockin' in Rhythm'), and these are all originals by SOKO Steidle." "The band's sound is defined by the fact that we play together in this setting for about ten years now", remarks OliverSteidle. "This means things evolve, they happen by intuition. With Jan Roder I can stretch therhythm as if we were playing faster or slower, - you can't figure it out, and that is important." Roder's tugging bass and the sounds from (bass-) clarinetist Mahall grappling with those from altoist Walsdorff are the ingredients of this music. "You have to find structures out of nowhere," says Steidle, "we don't want to be as precise and perfect as possible, - empathy, intuition and attentive listening are mostimportant to us."